Plywood and OSB structural panels possess inherent strength and stiffness. They resist bending or deflection, racking or shape distortion and impact damage. Because of their split resistance, wood structural panels possess excellent fastener-holding properties and can be nailed very near panel edges. For most applications, stiffness is one of the biggest benefits of wood structural panels. Excellent stiffness is measured as resistance to deflection under uniform and concentrated loads and to forces that would tend to distort the panel from its rectangular shape in the panel plane, a process known as racking. This stiffness often permits wood structural panels to be used with no additional bracing by other materials. Wood structural panels are perfect for heavy-duty applications common in industrial uses. The strength and stiffness of structural wood panels are based on the grain direction in the layers of wood, the species of the wood, the bond classification and the manufacturing process. Much of the information about a wood structural panel's strength and stiffness can be garnered from closely examining its trademark. 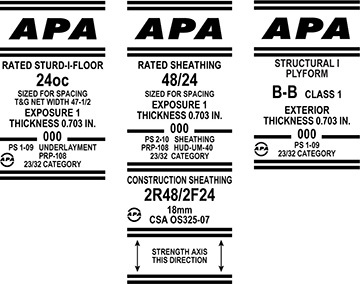 The APA trademark contains a Span Rating, which is the maximum recommended center-to-center spacing, in inches, of supports over which the panels should be placed in construction applications. For APA Rated Sheathing, the Span Rating is denoted by two numbers separated by a slash, such as 32/16, 48/24, etc. APA Rated Sturd-I-Floor panels are designed specifically for single-floor (combined subfloor-underlayment) applications and are manufactured with Span Ratings of 16, 20, 24, 32 and 48 inches on center. The higher the span rating numbers, the stronger and stiffer the panels regardless of panel thickness. These span ratings are found in many of APA's design tables. Download the APA Trademarks & Grade Stamp Anatomy PDF with detailed line-item definitions. Because it is sometimes necessary to have engineering design information for structural panel products when used in construction applications, APA provides design capacities for the various span ratings and section properties for various panel thicknesses. These values are listed in APA's Panel Design Specification, Form D510. APA Technical Note Load-Span Tables for APA Structural-Use Panels, Form Q225, contains uniform load tables calculated using these design capacities. These loads are recommended when engineering principles are used for design. It is important to remember that structural engineering principles alone do not necessarily take into account other factors, such as moisture and thermal conditions, which may affect design. The information on this site and in APA publications applies only to products tested and inspected under APA programs. Consult these two publications for more information on design capacities for span ratings. 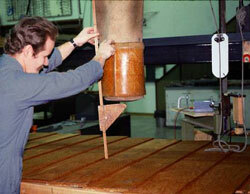 Plywood is manufactured from more than 70 individual or grouped wood species and trade groups of woods. Those species and trade groups are categorized in five numbered groups by mechanical properties. Group 1 woods exhibit the highest strength and stiffness characteristics and Group 5 woods the lowest. Basic plywood strength and stiffness characteristics for a given panel thickness are determined by the wood species group and veneer grade used in the panel makeup. 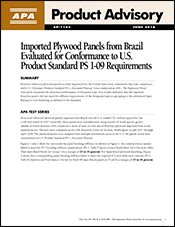 Details on relationship between wood species groups and wood panel design stresses are covered in APA's basic design manual, Panel Design Specification, Form D510. Oriented strand board (OSB) strength and stiffness are based on span ratings and not affected by the wood species. APA plywood and OSB structural panels are manufactured to meet minimum performance criteria given in several standards including Voluntary Product Standard PS 1-09, Structural Plywood, Form L870, and Voluntary Product Standard PS 2-10, Performance Standard for Wood-Based Structural-Use Panels, Form S350. To qualify for a given Span Rating under the standards, a panel must meet all of the criteria for that rating. As a result, mechanical properties that are characteristic of APA wood structural panels are typically greater than the minimum necessary to pass one criterion. Exterior panels may be used for applications subject to long-term exposure to the weather. Exterior plywood is made with moisture-resistant glue and, in addition, is composed of C-grade or better veneers throughout. This combination provides maximum resistance to the effects of daily cyclic variations of moisture and temperature caused by long-term exposure to weather. Exterior OSB is additionally protected by a weather-resistive surface overlay. Exposure 1 panels may be used for applications which are not permanently exposed to the weather. These panels are intended to resist the effects of moisture due to construction delays or other similar conditions. In addition, Exposure 1 panels may be used where exposure to the outdoors is on the underside only, such as roof overhangs. Load tables for wood structural panels for pallet bins are available in Materials Handling, Form M200. Consult Tables 12, 13 and 14. Plywood properties have traditionally been separately tabulated as section properties and design stresses. These are multiplied together to obtain a capacity. In many cases the resulting capacity will be quite conservative. Design-strength stresses are conservatively developed, taking into account grade factors and manufacturing factors, and then the data is statistically analyzed such that it represents the "lower end" of possible values. The stress is then further adjusted by a load factor or, as some call it, a factor of safety. At the same time, section properties are developed for virtually all possible layup combinations of veneer thickness and species. The lowest property value for a given panel thickness or span rating is then chosen for tabulation. The resulting capacity combines two already conservative values. In the 1990s, this procedure was largely replaced by direct publication of panel capacities. 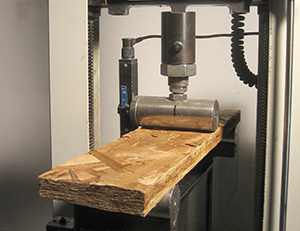 However, the section property and design stress technique is still used occasionally to analyze individual plywood layup variations. For more information on panel design capacities, consult Section 4 of APA's Panel Design Specification, Form D510. For typical Modulus of Rupture (MOR) and Modulus of Elasticity (MOE) values, consult APA Technical Topic: Mechanical Properties of APA Structural Panels, Form TT-044. Wood-based panels under constant load will creep (continue to deflect) over time. For typical construction applications, panels are not normally under constant load and, accordingly, creep need not be considered in design. When panels will sustain permanent loads that will stress the product to one-half or more of its design strength capacity, allowance should be made for creep. Limited data indicates that under such conditions, creep may be taken into account in deflection calculations by applying the applicable adjustment factor, found in APA's Panel Design Specification to panel stiffness. Design capacities apply to panels under moisture conditions that are continuously dry in service; that is, where the equilibrium moisture content of the panel is less than 16 percent. Adjustment factors for conditions where the panel moisture content in service is expected to be 16 percent or greater (Cm) are found in APA's Panel Design Specification, Form D510. Wood structural panels should not be exposed to temperatures above 200° F for more than very brief periods. Between 70° F and 200° F, adjustments to capacity generally do not need to be made, because the need for adjustment of dry capacities depends upon whether moisture content will remain in the 12 to 15 percent range or whether the panel will dry to lower moisture contents as a result of the increase in temperature. If drying occurs, as is usually the case, the increase in strength due to drying can offset the loss in strength due to elevated temperature. For instance, temperatures of up to 150° F or higher do occur under roof coverings of buildings on hot days, but they are accompanied by moisture content reductions which offset the strength loss so that high temperatures are not considered in the design of roof structures. To maintain a moisture content of 12 percent at 150° F, sustained relative humidity of around 80 percent would be required. The designer needs to exercise judgment in determining whether high temperature and moisture content occur simultaneously, and the corresponding need for temperature adjustment of capacities.